Hi, thanks for stopping by today 🙂 I am sharing 2 cards that I made in December for my sister’s twin niece’s. I used Mama Elephant’s ‘Lunar Animals’ stamps and dies – these little characters are so cute! 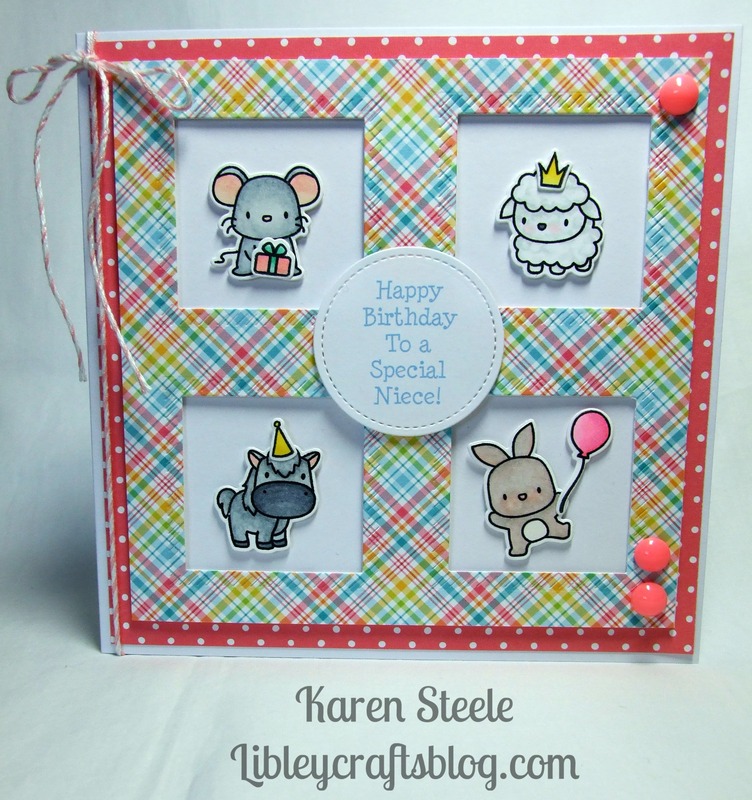 This was a really easy card to make as I just had to colour these critter’s and pop them in the windows that I’d created using My Favorite Things Inside and Outside Stitched Diagnol Square dies. Both cards were the same design basically, I just used different animals for each of the cards and a different colour scheme. Other supplies used: Lawn Fawn Stitched Circle Die and the following papers – Perfectly Plaid, Perfectly Plaid Fall and Let’s Polka in the Meadow. The gift and balloon stamps are also from a Lawn Fawn set – I think it was Party Animals! Belle and Boo enamel dots, Spectrum Noirs and twine. I know it is wrong to have favourites, but the bunny and the chick in these just really make me smile! This is a great way to use small images but give them a big impact, I think. Gorgeous. What lucky little girls! Thanks Gill, that’s very kind of you 🙂 Even though I have used this set quite a lot, it’s the first time that I’ve used the little chick – I do think it’s rather cute! Those little animals are just darling! Great design and love the plaid papers! Your twin niece’s will love these cards I’m sure! Happy Birthday to them!! Once I come up with a plan, I think I love creating multiples and I think a similar, but different car for twins is a great idea – these are so cute too! Great inspiration Karen! Same but different. The power of color never stops to amaze me. I think I’ll do as you did here with Christmas cards for this year as I’ll need do many, make two at the same time, and make them same but different:) cute small critter stamps! Both Cards are fabulous and unique, Karen. 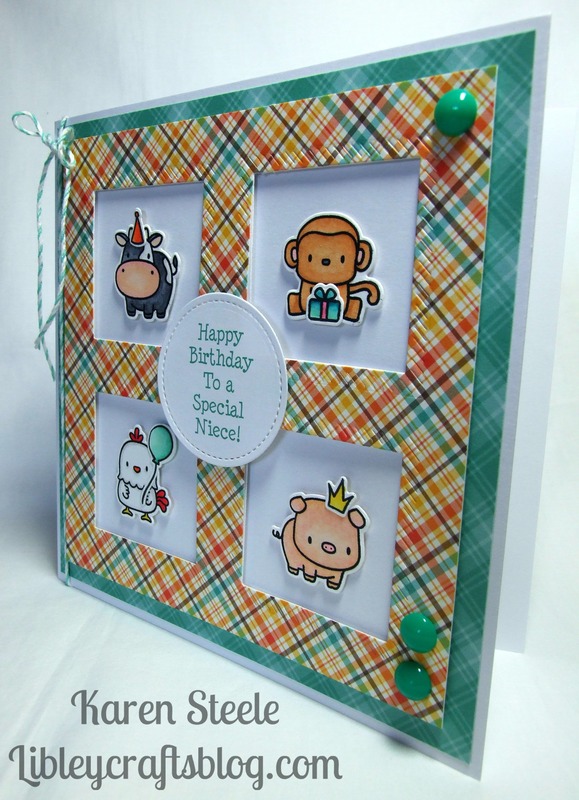 I like the plaid paper and of course the little critters. Oh goodness, Karen! Both cards are absolutely adorable! Such sweet images, and a really fun design!